As I mentioned a couple of weeks ago in a Meal Plan Monday post, I had never tried fresh artichokes. Yes, I have had them in dips and I eat the jarred hearts in salads and such, but I had never actually made fresh artichokes. My husband, on the other hand, has made them, but just for himself, as I was still not very interested. You see, I had this babysitter growing up that made them frequently and I thought they had a weird smell. This made me not want to eat them. Now, almost 30 years later, I have tried them and liked them! I have to say too, that my inspiration was my friend Heidi over at Adventures of a Gluten Free Mom. She has recently had a food revolution of her own, and on a bigger scale than just being gluten free, and joined our local CSA as part of her action plan. She has been receiving new vegetables in her boxes and artichokes were recently one of those items. Like me, she had never had them before – maybe it is because we are both from the Midwest where they aren’t as common? She was successful and her whole family enjoyed them so it gave me the courage to try them too! And so I used her microwave steam method and lemon dipping sauce recipe. 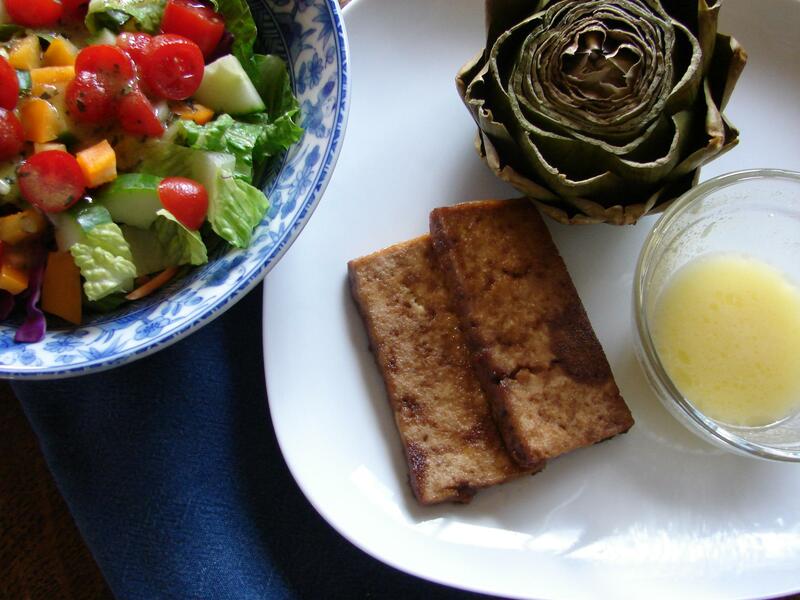 To go with them, I made an old stand-by recipe, Yummy Grilled Tofu, from another of my favorite gluten free bloggers, Sea at Book of Yum. This is one of our favorite ways to make tofu. The toasted sesame oil really makes it sing. We frequently grill this but I also put it in the oven or under the broiler. On this particular evening, I lined a glass baking dish with foil and put the tofu, in its marinade, in the oven for a while. Be careful if you put it under the broiler in its marinade as you could get a flare up from the oil in the pan. So, the verdict is – delicious! I’ll be making the artichokes again soon. What is your favorite artichoke recipe? No worm for you though I gather? LOL! Thx for the email, I have yet to dig further, but the info is MUCH appreciated! !